Here are the questions, answers, and explanations from our $0.10/$0.25 quiz. This hand is a borderline call in position against a 3-bet, generally speaking. However, given the high rake that is present at $0.10/$0.25 online, KTs shifts down to a fold. You shouldn’t 4-bet with this hand because there are better options that you can use to balance your 4-betting range, namely small Ax suited hands. Let's assume you folded and move on to the next hand. Discourage players behind from continuing (either by calling or 3-betting). Potentially win the pot uncontested. Isolate yourself against one or both of the limpers in position. Let's assume you raised and got called by both players. To the flop! This is an easy bet, but let's talk about what size is best. Small bet sizes are usually the way to go in multiway pots, but this spot is unique. You are very likely to have the best hand, the board has a lot of draws, and you are against two weaker players who will probably call too much; for all these reasons you should fire a big bet and extract a ton of value from either or both player’s ranges. Betting smaller than 75% of the pot is simply not going to win you as much money. Let's assume you did bet big and move on with the hand. Checking is correct in theory (because this turn hits several hands in your opponent's range), but you should probably continue betting for thin value versus this weak player. Why? Judging by his preflop play, your opponent probably doesn’t understand how bad of a card this is for his K9-type hands, nor is he likely to realize that your range has fewer bluffs on this turn. Consequently, he will call with enough worse hands to make this a good value bet. Let's say you did bet and see what happens. Although calling seems like a decent option given that you do have a gutshot to go with your top pair, it is a pretty bad option (though raising would be worse). The way that most weak players play is very passive. Thus, when they show aggression, they are extremely unlikely to show up with a bluff here. The worst hand he is likely to show up with here is something like 9♥ 7♥, which has 38% equity against your hand. Note that if your opponent called the turn bet, you’d be smart to check back on brick rivers. This hand is probably too thin to go for three streets of value, even versus a weak player. Let's assume you make the right fold and move on to hand #3. The SB’s range in this spot is pretty well understood by many 25NL players. It is made of between 12-18% of the best preflop hands, most, if not all of which are played as a 3-bet. Against such a range T9s is a call even after factoring in the high rake. 4-betting this hand would be a mistake since it blocks the 3-bet folding range of SB and unblocks the 3-bet continuing range. Hands such as A2s and K8s serve much better as 4-bets. Let's assume you called and take a flop. Even though you have a gutshot draw to go with your 2nd pair, your opponent’s range is weighted so much towards value bets -- with very few possible semi-bluffs -- that a call is not profitable. Raising this hand at a low frequency is also an acceptable play against good, thinking players. Let's say you made the fold and move on to the next hand. You will have much better hands than this to defend against UTG’s c-bet. This hand is simply way too weak to consider a call even against the small bet and with the advantage of being in position. You will have to fold versus a bet on every turn except an 8 and your opponent will be able to represent any hand, thus playing perfectly against your hand. Raising is by far the best play here because you have enormous value to gain from UTG. By raising, you extract value from a lot of his pairs and draws, of which he can have many. By just calling you are letting this guy realize way too much equity while missing out on a prime opportunity to extract value. Let's assume you raised and he called. Even though your hand has dropped in value due to the overcard, it is still well ahead of your opponent’s range. If you think about his range, UTG will rarely have a queen here. He might have Q9, Q6s, or Q4s, but that’s about all. A big bet for value is in order as this is likely the last street that we can extract value. Checking here would be a big mistake since it would let him realize a lot of equity for free. Also, most river cards will make it very difficult to either call a bet or bet yourself, so it's pivotal you extract some value before then. Bingo! That's a great card for you. You should definitely bet for value now since your hand has improved against UTG’s range. If UTG still had some 2-pair combinations in his range, you now beat them. You should not be afraid to bet big here as the UTG is likely capable of hero-calling given the general tendency of recreational players. If he thinks you are bluffing, he may call you down as wide as 7♦ 4♦. As far as sizing goes, shoving is probably best, though you could make a good argument for betting smaller (~$15) to try to induce more calls. You should most often raise here. The reason is that you will have a decent amount of value hands that need to be balanced with bluffs, making you tougher to play against. 32s with a backdoor flush draw is a top pick for the bluff check-raising range. Check-raising is also very good here because of how players usually react to check-raises on low boards. 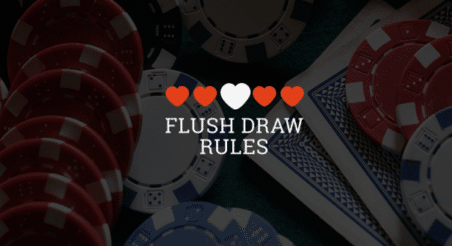 Versus a raise, the cutoff is, in theory, supposed to float with a number of backdoor flush draws in order to defend at the correct frequency. Since very few players do this, you are incentivized to use an aggressive check-raising strategy. That being said, check-calling is not a bad option either. Let's say you check-raised and he called. You still have 99, 55, 44 and 54s in your range. You need to balance those value hands out with some bluffs and there are few better candidates than 32 in this spot. This hand is an easy bet on the turn. Let's say you get called. Bad news! You missed the open ender and all of the draws in your range have missed. In these spots, you tend to get called more often which makes it tough to bluff profitably. That said, 32s is simply the perfect bluffing hand in this spot. It blocks none of your opponent's auto-folds (such as 76s, JTs, 97s, etc.) and it's the very bottom of your range. If you had a hand like 76s, which blocks some of your opponent's most likely folds (97s, 96s, 76s, and possibly 77 and 66), giving up would be the correct play here. But 32 makes the most sense as a triple barrel bluff.